Master the sweet, hot, salty and sour balance and you hit the jackpot. Your confidence will grow when you discover the purpose of each ingredient in the finished dish. Make a curry paste from scratch to ensure a dish that makes your tastebuds sing, wok toss an amazing Pad Thai and immerse yourself in the flavours and texture of Mango, Coconut Cream and Black Sticky Rice. By experiencing this especially designed menu over 3-hours in our kitchen, authentic skills, methods and techniques are covered as well as learning about commonly used Thai ingredients and it is guaranteed to inspire you to include Thai food in your regular repertoire. Attending a hands on class will also provide the opportunity to improve knife skills, which are all important to this style of cooking. 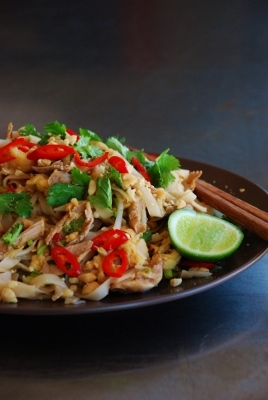 This class is high energy which reflects the nature and flavours of Thai cooking. With some modification of recipes this class is suitable for Gluten Free diet (using tamari in place of soy sauce). Not suitable for Vegetarian diet. Please advise of dietary requirements on booking, thank you.